Growing up with an Asian mom, rice was a staple at the majority of our meals. One of my first kitchen appliances that I ever bought was a rice cooker so I could steam my own rice. Something about boiling rice in a pot just seemed wrong (although it’s a perfectly legitimate way to cook rice.) The only problem with both of these cooking methods is time. When you’ve got hungry people coming home from work, time is one thing you don’t have enough of. Fortunately, Uncle Ben’s has a line of ready-to-microwave rices that are ready to serve in just 90 seconds. In addition to their Ready Rice, Uncle Ben’s has a line of Whole Grain medleys that help offer the health benefits of whole grain. 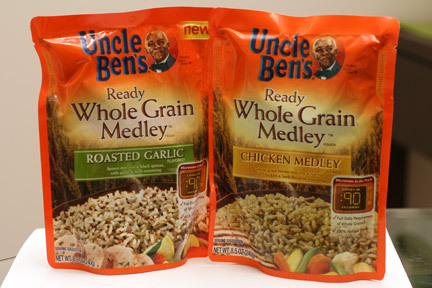 Uncle Ben’s recently came out with two new varieties of medleys – Roasted Garlic and Chicken – that join their current Santa Fe, Brown & Wild, and Vegetable Harvest Medley Flavors, Uncle Ben’s recently came out with two new varieties of medleys. There are so many great things about Uncle Ben’s Ready Whole Grain Medley’s that it’s hard to list them all. First, they are the easiest rices to cook. Simply separate the rice in the bag a little by squeezing the bag, then tear a small hole in the bag to vent. Throw it in the microwave and 90 seconds later you have a bag (about 2 cups) of perfectly seasoned, perfectly cooked rice. If you don’t have a microwave, you can also cook the rice in a skillet by stirring it with 2 tablespoons of water. Except for being just a touch high in the salt content, Uncle Ben’s Ready Whole Grain Medleys are also a very healthy side dish. These are made with 100% Whole Grain, are cholesterol-free, and have 0 trans fat and no saturated fats. They are a great source of fiber, offering 3 or 4 grams of dietary fiber, as well as Niacin (20% DV), Thiamin (10/15% DV), and Folate (8%/15%.) A serving (1 cup) of the Chicken Medley is just 210 calories and a serving of the Roasted Garlic is just 200 calories. 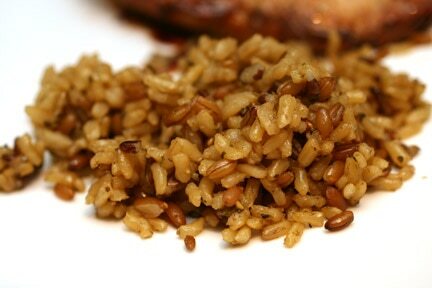 Uncle Ben’s Ready Whole Grain Medley – Roasted Garlic is brown rice, red and black quinoa, with garlic & herb seasoning. I’ll be honest that I was a little worried when I pulled this bag out of the oven. The garlic smell was very strong and I was worried that it would taste just as powerful. All my worries went away with my first bite.The garlic flavor was definitely there, but it blended in with the rice and the herbs. I think the quinoa (the little black things that look like giant peppercorn) helped to add a hearty balance of flavor to the rice as well. The garlic flavor is definitely the star of this side dish. Uncle Ben’s Ready Whole Grain Medley – Chicken Medley is whole grain brown rice, rye and red rice, with chicken & herb flavored seasoning. I loved this rice from the first bite. It has a lovely chicken flavor that provides a savory taste to the rice. Interestingly the pieces of rye gave a nice slightly crunchy texture which was very pleasant. The chicken along with the herbs really made this rice taste like herb-roasted rotisserie chicken. The flavors are a little more subtle than the Roasted Garlic Medley. After tasting both of these rices, there are really so many things that I love. Both rices cooked up perfectly in their pouches. 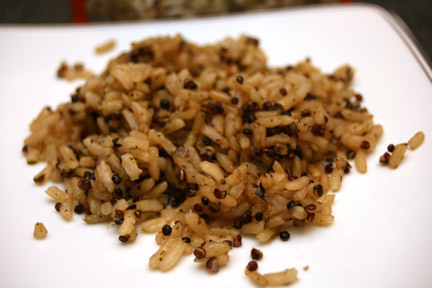 Every grain of rice I ate was cooked perfectly – it was tender and moist, not dry-tasting like other brown rices I’ve had. I loved the flavors for both rices – they were each unique, distinct, and didn’t require any additional seasoning. They were wonderful sides that complimented both the steak and chicken dishes that I ate with them. There’s no question that they are convenient – 90 seconds and BAM. The two new varieties are available for sale in stores nationwide for $2.29 SRP. 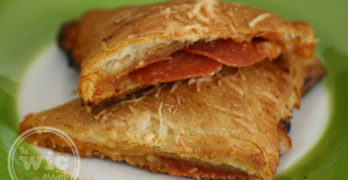 For more information about Uncle Ben’s Ready Whole Grain Medleys, recipes, and other tips you can visit www.unclebens.com. The website is currently offering a coupon to save $0.75 off any two Uncle Ben’s rices. What’s Cooking at DD Uncle Ben’s Whole Grain Medley Giveaway! One winner will receive THREE pouches of EACH NEW VARIETY of Uncle Ben’s Ready Whole Grain Medley. That’s 3 pouches of Chicken Medley and 3 pouches of Roasted Garlic. YUM! Disclaimer: This post consists of my (and/or fellow tester) opinions only. Your experiences may be different. No compensation was given for this review/giveaway. I did receive free Uncle Ben’s Ready Whole Grain Medley from the manufacturer or their representing PR agency to use and test for the purposes of this review. This did not affect the outcome of this review. I think I would try the brown and wild. [email protected] The French Vanilla Rice Pudding appeals to me. I would love to try the vegetable Harvest! I would like to use Uncle Ben's Whole Grain Brown Rice as the basis for a Chinese style fried rice dish. That and some cold beer. the whole grain medley with the roasted garlic flavor sounds good! I'd like to try the Vegetable Harvest Ready Whole Grain Medley. UNCLE BEN'S® Long Grain & Wild Roasted Garlic & Olive Oil is the variety I like best- Its wonderful with meat, fish or, cooked black beans if there's a vegetarian in your family. I fanned you on facebook- left a nice message on your wall, also. i'd like to try the whole grain brown rice. I would love to try the brown and wild. I would like to try the Uncle Ben's Basmati Ready Rice. I tend to like the traditional Uncle Ben's varieties – and the Sun-dried Tomato Florentine flavor of the Long Grain & Wild Rice looks yummy. I like the Vegtable Harvest. I would like to try the Santa Fe Ready Whole Grain Medley. It sounds delicious with all the added ingredients and spices. I'd like to try the Vegetable Harvest. Thanks. I would love to try the Long Grain and Wild Rice variety, thanks! I'd like to try the ready rice Spanish flavor. Thanks for the chance. Oh, I'd so try the rice pudding. 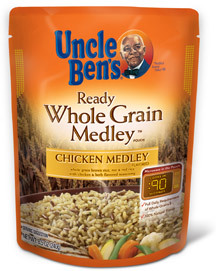 The Uncle Ben’s Ready Whole Grain Medley – Roasted Garlic sounds fabulous! I'd like to try the whole grain and wild rice! Id like Chicken Medly.Thanks for the chance. I'd like to try the Herb-roasted Chicken flavor of the Long Grain and Roasted Rice series. Thanks! I like the Garden Vegetable Ready Rice. My family would love the new roasted garlic version. The Broccoli cheddar Whole grain white rice caught my eye! I'd like to try the Santa Fe Whole Grain Medley. I'd like the Brown and Wild Whole Grain medley (or melody as my mother used to say). Uncle Ben's Country Inn – Chicken & Vegetable Rice. I'd love to try the Rice Pudding mix! I'd like to try the Santa Fe. This is tough … I was going to say Spanish Style but I think I'd like Cajun style better! I'd like to try their Jasmine rice. I want to try Santa Fe. I love love love rice! The Country Inn varieties seem great too…I'd probably try the Chicken one first. I'd like to try the Chicken Medley. I'd like to try the Ready Whole Grain Medley in Vegetable Harvest. Thanks. The Brown and Wild Whole Grain Medley is my choice! I would love to try the cajun style rice. I have never tried Uncle Ben's microwave rice before but sounds so yummy. The roasted garlic would be great paired with pan fried chicken for a quick dinner. I'd like to try the Santa Fe Ready Whole Grain Medley rice. Vegetable Harvest sounds really nice. Cinnamon and Raisins Rice pudding sounds great!Thanks for the giveaway! Cinnamon and Raisins Rice pudding sounds great! Vegetable Harvest sounds like a good one to try! I would like the try the Butter and Garlic Ready Rice. I'd like to try the Roasted Garlic Medley. Thanks! I'd like to try the whole grain medley! The chicken medley sounds great. I would like to try the Herb Roasted Chicken rice. We had the ready wild rice tonight and was very disappointed. I will take the longer cooking wild rice next time.